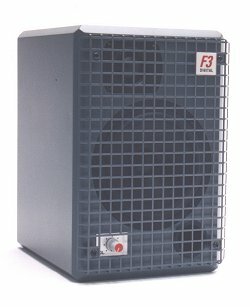 The "F3" is a small active monitor system with the same transparent sound compared with the other AUDIO "F" monitor systems. The "F3" has been specially designed as easy accessible personal monitor with analogue and digital inputs. The drivers of the "F3" are magnetic shielded. The vented speaker enclosure contains two power amplifiers, a crossover network and a 20 bit D/A converter. Mounting in a 19-inch rack is possible by means of special brackets (optional). A 5-inch woofer with a special mineral filled polycone is used as a bass driver. A 25-mm soft dome tweeter reproduces the high frequencies. The crossover section section consists of a 4th order Linkwitz-Riley filter at a frequency of 3100 Hz. Depending of the acoustic environment level corrections can be made at a frequency of 70 Hz. A gain control is provided on the front panel to adjust the sound volume. View the "F3" specification sheet.